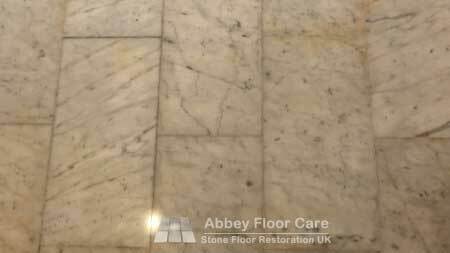 This marble polishing St Johns Wood London project arose as my client was searching for a marble polishing service covering Central London. 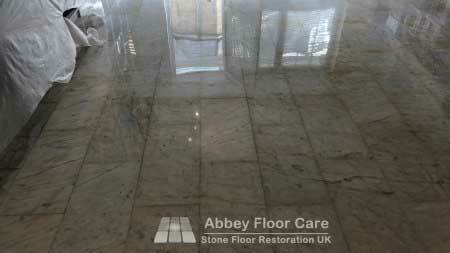 The Arabescatto marble floor is around 25 years old and I was asked to quote to polish the marble floor to a high shine. After evaluating the floor, I noted that the traffic lanes were dull and there was a considerable amount of lippage across the floor. Lippage is a difference in the height of adjoining tiles. I recommended that the floor is ground smooth and then honed and polished to a deep lustrous finish. 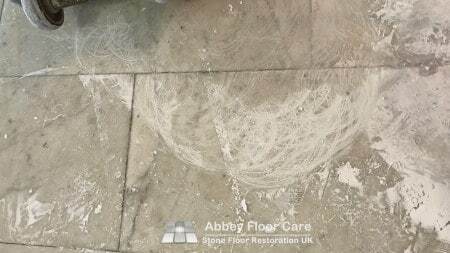 My client contacted me to tell me that some other companies had raised their quote once they had seen the amount of lippage on his floor. I confirmed that I was more than happy with the price I had given him. I had already accounted for the lippage so my price would not increase. We agreed to proceed with the work and estimated that it would take 3 to 4 days to complete. I started by grinding the floor with using a heavy marble grinding machine and 30 grit metal sintered diamond tooling. The image above shows the grinding machine. The machine has a splash guard to prevent the tooling splashing slurry around the floor. As you can see in the photograph above, this is very aggressive grinding, leaving deep scratch marks in the marble. 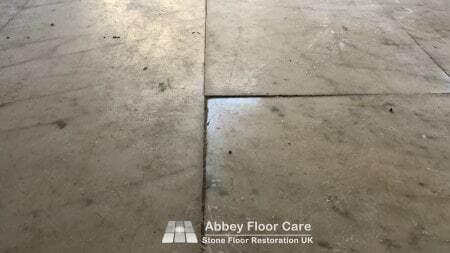 However if it the quickest way to remove lippage and render the floor smooth. 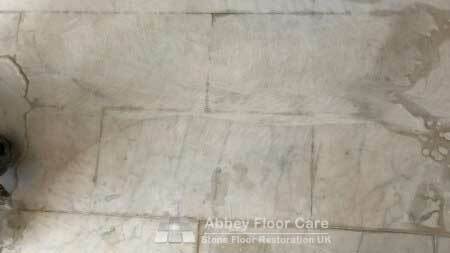 The photograph above shows the floor after the first pass with 30 grit diamonds. I had to complete three passes before the floor was smooth. I finished the grinding process by using 90 grit metal sintered diamond tooling to remove the deep scratch marks made by the 30 grit diamond tooling. The picture above demonstrates how the 90 grit metal diamonds have removed the deep scratches from the lower half of the image. The floor was then ready for honing. I started the marble honing process with 100 grit epoxy diamond tooling, followed by 200 grit and 400 grit epoxy diamond tooling. 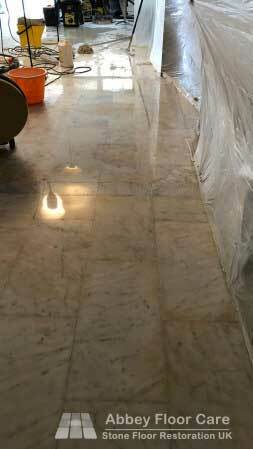 I started the marble polishing stage with 800 grit epoxy diamond tooling, followed by 1,500 grit and 3,000 grit tooling. 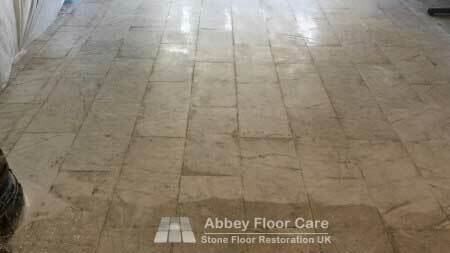 The image above shows the floor after diamond polishing. The floor has a high level of reflection, however, there is a final stage to create a mirror-like finish. Finally, I created a beautiful, mirror-like finish with marble polishing powder. The floor was originally split into 2 rooms and one area of the floor was a different level. Small tiles had been inserted at an angle to account for the level change. 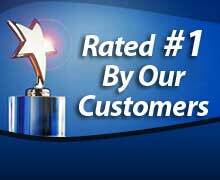 My client was delighted with the results and congratulated me on my “excellent work”. 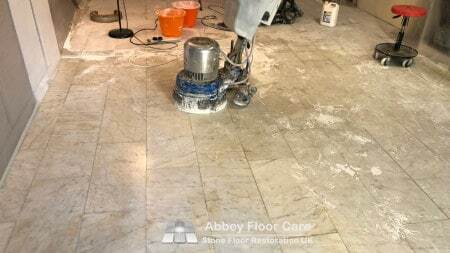 If you are looking for marble polishing St Johns Wood London services or elsewhere around the country, please complete this simple contact form for a free, no-obligation quotation.